Titled Jungle Lodge For Bar/Restaurant Business at Popular Red Frog Beach. Jungle lodge located at Red Frog Beach. Situated near other popular beach bars, restaurants and lodges, this is the place to build your own dream business. The property has solar power, water collection system, septic in place, full commercial kitchen, and essentially everything you need to start your own business. The original owners built this beautiful building themselves working very hard and bringing all materials one by one from Bocas Town. They never got the chance to open their dream, as they went back to Europe for family. At the back of the building are 2 very nice guest rooms. Currently the business is being used as a yoga studio and the rooms are being rented. 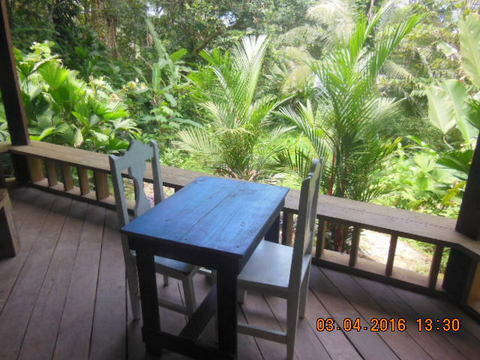 There is also ample room on this titled property to build small hillside cabinas with plenty of jungle views including monkeys, sloths, and tropical birds that come right up to the lodge. The owners have done all the heavy lifting and now you can benefit operating your own dream Caribbean beach business located at a very popular place. Bring offers!